Debra Chinnock and her son Tom felt the earthquake while watching Coronation Street on TV at their home in Pyle, Bridgend. An earthquake, the largest measured in south Wales for 34 years, has been confirmed by seismologists. 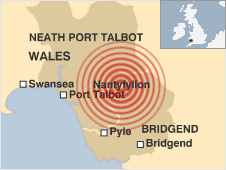 The quake was felt at 2042 BST on Friday with the epicentre near Nantyffyllon, 6.2 miles (10km) north east of Port Talbot. The British Geological Survey (BSG)confirmed it had a magnitude of three. South Wales Police said there were no reports of injuries but residents said furniture, doors and windows had been shaken and pictures fell off walls. The quake was the largest in the region since May 1975, when there was an earthquake measuring 3.8 near Merthyr Tydfil. 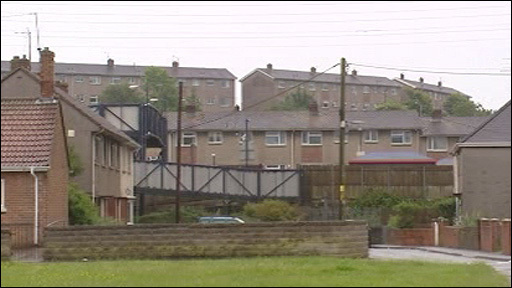 Police said residents in the Bridgend area reported feeling tremors. Debra Chinnock of Pyle, Bridgend, said: "I was sitting on the settee watching the television and all of a sudden the floor shook, the windows, everything. It was scary. "We all just looked at each other and the dog barked. The neighbours all came out. "I rang up my mother-in-law who lives up the road and she said she'd felt it too. "I have experienced an earthquake before in Greece and my husband went through one measuring 7.2 on the Richter scale in Italy in 1982." Caroline Richards said pictures fell off the wall of her house in North Cornelly but she didn't realise it was a quake until reading about it on the BBC website. "We ran outside as we thought something had hit the house or fallen on it," she said. Rory Mainwaring, also from North Cornelly said he thought someone had fallen over upstairs. "First off we heard a loud rumbling noise then our heads went very tight and everything shook, " he said. A tremor with a 5.4 magnitude hit north Wales in 1984, while in February 2008 a quake with a 5.3 magnitude was felt in different parts of Wales, although its epicentre was in Lincolnshire. A BGS spokesman added: "Historically, larger earthquakes, with magnitudes ranging from 4.9 to 5.2, have been known to occur to the west of this event, the last and largest of these being a magnitude 5.2 that occurred in 1906 close to Port Talbot. "Known as the Swansea earthquake, this was one of the most damaging earthquakes in Britain in the whole of the 20th Century." We asked you for your experiences and here are just a selection of your responses. I thought the opencast had started blasting again. Then remembered they have stopped working. A very strange feeling! "Did the earth move for you?" It sure did!! I was sitting down watching the TV when everything just started shaking. It only lasted a few seconds but I thought a car had crashed into a wall or something so I looked outside but didn't see anything so I thought nothing of it. I only found out on BBC on Saturday morning that it was a magnitude 3.0 earthquake. We were sitting together on the sofa when it happened. It was as if someone had bumped into the furniture; a single thump. And the TV on its stand shook once. My wife and I looked at each other and wondered what it could have been. The local quarry does not blast at night and there was no sound of traffic. Thanks to the BBC Wales news this morning, we discovered what had happened. Obviously we are not close to the centre but it was a real event, and not the wine we had with dinner! I do not know if this is the same reason for the quake. But watching t.v our elec/fire light was flashing I said to the wife the bulbs are going, then a few sec it corrected it selve, I later when to the bedroom and discovered the radio time was flashing as if we had a power cut.it may not be the same ? but we did not feel or heard any sound of a quake. i was watchin tv at this time and felt the bottom of my sofa shook i though what the hell is in this as its brand new. i took all cushion off and was shacking it nothin was in it. so sat back down to watch tv my partner said i was mad. till i heard about this. so now i no it must of deff been this. We were watching the cricket on tv when suddenly the house shook and I could actually see one wall move. The pictures fell off that wall! We ran outside as we thought something had hit the house or fallen on it. Didn't realise it was an earthquake until seeing it on the website this morning. My friends were all laughing at me last night when I put my status on facebook saying the house had moved by itself. Now they know I wasn't lying!! friday evening i was chatting with my husband online and the lights started to flicker and then everything went dark for about 2 minutes then it came back on. i put it down to a power cut but then heard about the earthquake around the same time. i was sitting in our loft conversion at the computer when between 8.45-50 pm there was a low rumbling sound and the whole loft shook and rattled. it was scary. my instinct was that it was earthquake and i just ran downstairs to check if anyone else in the house felt or heard it. my husband was in our lower ground floor room and he heard the rumbling sound. i then looked online to find anything about it and reported it to BGS. they then replied to my report confirming it. The first I knew about the earthquake was when my sister phoned from Lincoln to check if we were ok.There must have been something really engrossing on TV last night as I only live a mile away from the epicentre. I felt it in Pontypridd which is quite far from the epicentre. I thought I was going crazy! but then logged on to the British geological survery site and seen there had been 3 quakes the day before elsewhere in the country. My girlfriend didn't believe me when I said i felt an earth tremor and only believed me when she seen it on the news this morning. I feel priveleged to have felt it. Didn't feel a thing, and I only live a mile away from the epicentre. I'll have a look around the house now to check for cracks !! I was sat at the computer in an upstairs room and I felt my chair shake and the window rattled. It sounded as if someone had ran a car into the house. Odd thing was my wife and daughter were downstairs and didn't feel a thing. We were sat at home watching TV when the front of the house seemed to shudder, the lounge window,front door and kitchen door rattled at the same time. It only lasted a second but was very noticable. We don't know if we could have felt the tremour in our area but we found a mirror of ours had fallen off the wall when we woke up this morning. The mirror has been hanging for 5 years and has never just fallen off the wall before! And the dog has been on edge! I heard a distant rumbling and the picture frames fell off the walls. I had no idea it was an earthquake until I checked the BBC News website.